Home » BARNEY, CHARLES D.
CHARLES D. BARNEY,(1844–1945) a stockbroker and the son in law of J. Cooke, founded Charles D. Barney & Co in 1873. In 1938 Charles D. Barney & Co. and Edward B. Smith & Co. merged forming Smith Barney & Co.
1901, Oklahoma. Stock certificate for 16 shares in the Choctaw, Oklahoma & Gulf Railroad Company. Purple/Black. 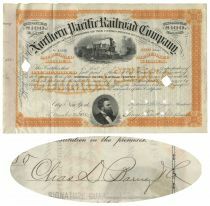 Issued to Charles D. Barney & Co. and signed by Charles D. Barney for the company on verso. CHARLES D. BARNEY (1844 - 1945) Co-founder of the brokerage powerhouse Smith, Barney & Company. Stockbroker to E.H. Harriman, Henry Clay Frick, William Rockefeller. Punch and stamp cancelled. Very Fine. 1880. Minnesota. 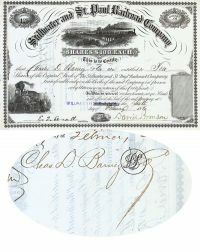 Stock certificate for 10 shares issued to Charles D. Barney & Co. and signed by Charles D. Barney as the company president. Multi-vignetted. Train traveling though countryside at top center. Locomotive at bottom left and small vignette at bottom center of a factory. This is an excellent autograph piece.